← SEAT SALE: Get your passports ready…. Don’t you hate it when your name gets spelt wrong on your Starbucks cup? You’ll probably tweet or Instagram about it but you’re still annoyed that it happened. 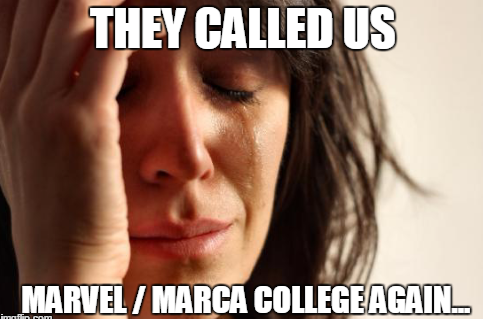 We feel your pain: every single time you call us Marvel/Marca, we get annoyed too. So, why did we change our name? And what does ‘MC’ stand for? From 1925-2000, a few of our campuses were called ‘Marvel’ but our Saskatoon campus was called ‘Marca’. After getting a letter from Marvel comics, legally banning us from using ‘Marvel’, we decided to brand all campuses under one name. The new name needed to reflect our passion for the industry and explain what we do. We decided to re-brand as ‘Masters of Cosmetology College’. The name was a bit long to say, write, text and type, so we shortened it to ‘MC College”. We get it, change is hard but we’re still the fun, creative and diverse Hairstyling, Esthetics and Fashion Design School that you have always known us by, just with a different name: MC College.